The chicken-and-egg, forest/trees question for those who produce educational and public service media is really who are we producing our content for. MIT’s Director of Digital Learning Sanjay Sarma has said that “we” – universities in particular (but also museums, libraries, and other educational and cultural institutions) – “are all sort of Disney, and Sony, and MGM – we produce movies.” But who are we producing our movies for? The answer is – perhaps obviously – that we are producing for multiple stakeholders, but that many of us are really producing these productions for the world. At a time when so much crap is happening around the globe, it is ever more clear that our real responsibility is to improve the planet while we are on it, and if we can help effect that by sharing our knowledge, so much the better. Much as U.S. and other national industries of research and scholarly publishing have begun to mandate some form of open or free licensing for the output of grant-funded written work, so now the question arises should video and educational video in particular find its way, too, into the commons. Here, too, the answer is: of course. On the occasion of the third LEARNING WITH MOOCS conference at the University of Pennsylvania, Intelligent Television is releasing a new guide: MOOCs and Open Educational Resources: A Handbook for Educators. The guide is a step-by-step manual to how to produce and distribute educational video content under the freest of licenses, with an emphasis on Creative Commons. 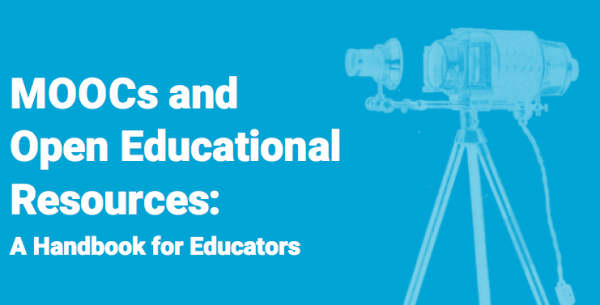 The Handbook situates educational video production in the context of more than 100 years of moving-image work at universities and beyond. Indeed, the booklet draws on the work of educational producers from the early 1900s – works such as Charles Urban, The Cinematograph in Science, Education, and Matters of State and the 1920s journal Visual Education. The impulse to share knowledge in a free environment also is not new. In many ways MOOCs and Open Courseware and Wikipedia and Creative Commons and Google/YouTube are all part of the same project – envisioned by visionaries such as Richard Stallman, media producers behind the start of public broadcasting here and abroad, much earlier, even, by publishers active centuries ago in the Enlightenment, and even earlier, in ancient Alexandria under the Ptolemaic kings. The vision? A giant rich resource: a gigantic global encyclopedia, or Encyclopédie, or library or museum, contributing to universal access to human knowledge. With the Internet upon us now, we can help realize it. Does the rest of the world have any right to the knowledge that we produce at universities and other cultural and educational institutions? And do we have any obligation to share it? We live once, but our problems live on. And if the work of Richard Hofstadter (an expert on "anti-intellectualism" and what he called "the paranoid style in American politics”) and Edward Said (so wise on the collapse of colonialism and media bias), just to pick two Columbia University examples, could have been recorded and shared – and shared openly – we’d be the richer for it. Disseminating knowledge now through the world’s most powerful medium could be our highest calling. Start reading MOOCs and Open Educational Resources: A Handbook for Educators here. Peter B. Kaufman is an author, educator, and film producer and the founder of Intelligent Television in New York. Twice serving as associate director of Columbia University’s Center for Teaching and Learning, he produces films and educational video in close association with universities, museums, and archives, and he publishes, produces, and organizes numerous projects at the intersection of video, education, and open educational resources. He is executive director of a foundation to promote Russian literature and culture and runs a summer documentary filmmaking institute for high school students every year in Connecticut.